Regulation (EC) No 1198/2006 (the basic Regulation) replaces Council Regulations (EC) No 1263/1999 (2) and (EC) No 2792/1999 (3) taking into account new developments in the field of fisheries, fisheries areas and inland fishing. It is therefore appropriate to lay down detailed rules for implementing the basic Regulation. Detailed rules should be laid down for the presentation of operational programmes. In order to facilitate the establishment of the operational programmes and their examination and approval by the Commission, common rules should be laid down for the structure and content of such programmes, based in particular on the requirements set out in Article 20 of the basic Regulation. As regards support for measures for the adaptation of the Community fishing fleet, the Member States should present in their operational programmes the methods for the calculation of premiums. As regards the possibility provided for under Article 25(4) of the basic Regulation to achieve the reduction of engine power by a group of vessels, the conditions for this possibility should be specified. Certain terms used with special reference to aquaculture and the processing and marketing of fisheries and aquaculture products, should be defined to ensure that they are uniformly understood. As regards support for productive investments in aquaculture and investments in processing and marketing, the Member States should explain in their operational programmes how they will ensure that priority is given to micro and small enterprises. As regards support for animal heath measures, detailed conditions should be laid down to ensure compliance with the Council Directive 2006/88/EC of 24 October 2006 on animal health requirements for aquaculture animals and products thereof, and on the prevention and control of certain diseases in aquatic animals (4). As regards support for measure of common interest, the eligible expenditure should be defined. As regards the fisheries areas referred to in Article 43 of the basic Regulation, the conditions for their selection should be specified. The public-private partnerships supported under Article 45 of the basic Regulation should comply with certain detailed conditions. As regards support for the sustainable development of fisheries areas, the procedures for selecting groups should be transparent in order to ensure that pertinent and high quality local development strategies are selected for support. Rules common to several measures should be laid down. In particular, in order to ensure a better targeting of investment operations, a set of common rules for the definition of eligible expenditure should be made available. In order to guarantee that information on possible funding opportunities is disseminated widely to all interested parties and for the sake of transparency, the minimum content of the information measures needed to inform potential beneficiaries about the financing opportunities offered jointly by the Community and the Member States through the European Fisheries Fund (EFF), including an obligation to publicise the steps that a potential beneficiary should take in order to submit an application for funding and the selection criteria that are to be used, should be set out taking into account the principle of proportionality. In order to enhance transparency regarding the use of EFF assistance, the list of beneficiaries, the names of the operations and the amount of the public funding allocated to operations should be published annually by Member States, electronically or otherwise. Making such information accessible to the public aims to strengthen the transparency of the Community's action in the area of the development of the fisheries sector, fisheries areas and inland fishing, to enhance the sound financial management of the public funds involved and, in particular, to reinforce control of the public money used and finally to avoid any distortion of competition between beneficiaries of EFF measures. Given the overriding weight of the objectives pursued, it is justified with regard to the principle of proportionality and the requirement of the protection of personal data, to provide for the general publication of the relevant information as it does not go beyond what is necessary in a democratic society and for prevention of irregularities. In order to ensure a better implementation of the information measures and to allow a better exchange of information between the Member States and the Commission on the information and publicity strategies and results, contact persons responsible for the information and publicity measures should be designated. Building on the experience of the 2000-2006 programming period, it is necessary to set out in detail the conditions which financial engineering instruments should fulfil in order to be funded under an operational programme. With regard to Article 59 of the basic Regulation and in the light of the experience gained, it is necessary to lay down the obligations which the managing authorities should have with regard to beneficiaries in the phase leading to the selection and approval of the operations to be funded, with regard to the aspects which the verifications of the expenditure declared by the beneficiary should cover, including administrative verifications of the applications for reimbursement, and on-the-spot verifications of individual operations and with regard to the conditions to be observed when on-the-spot verifications are carried out on a sample basis. It is also necessary to set out in detail the information which should be included in the accounting records of operations and the information to be kept as data on implementation which the managing authorities should record, store and submit to the Commission upon request. In order to ensure that expenditure under operational programmes can be properly audited, it is necessary to set out the criteria that an audit trail should comply with in order to be considered adequate. The audit of operations is carried out under the responsibility of the audit authority. To ensure that the scope and effectiveness of those audits are adequate and that they are carried out according to the same standards in all Member States, it is necessary to set out the conditions which those audits should fulfil. Experience has shown that it is necessary to set out in detail the basis for the sampling of operations to be audited, which the audit authority should observe in establishing or approving the sampling method, including certain technical criteria to be used for a random statistical sample and factors to be taken into account for a complementary sample. In order to simplify and harmonise standards for the preparation and presentation of the audit strategy, the annual control report and the closure declarations for which the audit authority is responsible under Article 61 of the basic Regulation, it is necessary to lay down detailed rules concerning their content and specify the nature and quality of the information on which they rely. In order to ensure the most effective application of Article 87 of the basic Regulation with regard to the availability of documents and the rights of the Court of Auditors and the Commission to have access to all supporting documents regarding expenditure and audits, managing authorities should ensure that information on the identity and location of the bodies holding the supporting documents is readily available and those documents should be readily provided to a minimum list of persons and bodies. For the same purpose, it is necessary to set out which data carriers may be considered as commonly accepted for the purpose of keeping such documents. To that end, the national authorities should lay down the procedures necessary to ensure that the documents kept are in conformity with the originals, when this is relevant, and can be relied on for audit purposes. In order to harmonise standards for the certification of expenditure and for the preparation of applications for payments, the content of such certificates and applications should be laid down and the nature and quality of the information, on which they rely, specified. Detailed procedures should be set out for keeping, in accordance with Article 60(f) of the basic Regulation, an account of amounts recoverable and of amounts withdrawn following cancellation of all or part of the contribution for an operation and for informing the Commission accordingly. Under Article 71 of the basic Regulation, the Member States are required before the submission of the first application for interim payment or at least within twelve months after the approval of the operational programme, to submit to the Commission a description of the management and control systems, a report setting out the results of an assessment of the systems set up and an opinion on their compliance with the provisions of that Regulation on management and control systems. Since those documents are among the principal elements that the Commission relies on, in the context of the shared management of the Community budget, to satisfy itself that the financial assistance concerned is used by the Member States in accordance with the applicable rules and principles necessary for protecting the Community's financial interests, it is necessary to set out in detail the information that such documents should contain and the basis for the assessment and the opinion. Article 57 of the basic Regulation provides that the arrangements for auditing are to be proportionate to the total amount of public expenditure allocated to the operational programme concerned. Where the public expenditure allocated to the operational programme is limited, it is appropriate that there should be an option for the Member State to rely more on national bodies and rules for carrying out certain functions related to the control and audit arrangements and that the Commission should therefore specify which verifications, which audits of operations and which obligations may be carried out and executed according to national rules and by national bodies. In those circumstances, the Commission should also differentiate between the means by which Member States have to fulfil the functions of certification of expenditure and verification of the management and control system and establish the conditions under which it may limit its own audit and rely on assurances provided by national bodies. As part of their management and control obligations, Member States are required to report and monitor irregularities. Detailed rules to implement that requirement were laid down in Commission Regulation (EC) No 1681/94 of 11 July 1994 concerning irregularities and the recovery of sums unduly paid in connection with the financing of the structural policies and the organisation of an information system in this field (5). It is appropriate, for reasons of clarity and simplification, to incorporate those rules into this Regulation. Provision should be made for the Commission to reimburse judicial costs when it requests a Member State to initiate or continue legal proceedings with a view to recovering amounts unduly paid following an irregularity, and for it to be provided with information enabling it to decide on the apportionment of the loss from irrecoverable amounts under Article 70(2) of the basic Regulation. Regular contact should also be provided for between the Commission and the Member States on the subject of irregularities, for the use of the information provided for making risk analyses and compiling reports, and for the provision of information to the relevant committees. In order to limit the administrative burden imposed by the reporting system while safeguarding the necessary level of information, Member States should, without prejudice to the obligations arising directly from Article 60(f) of the basic Regulation, not be obliged to report irregularities involving amounts below a certain threshold unless the Commission expressly so requests. The use of electronic means for the exchange of information and financial data leads to simplification, increased efficiency and transparency and to savings in time. In order to exploit those advantages fully, while preserving the security of exchanges, a common computer system should be established as well as a list of documents of common interest to the Commission and the Member States. It is therefore necessary to specify the format each document should have, and to provide a detailed description of the information such documents should contain. For the same reasons, it is necessary to specify how such a computer system functions with regard to the identification of the party responsible for uploading the documents and any updates thereto. 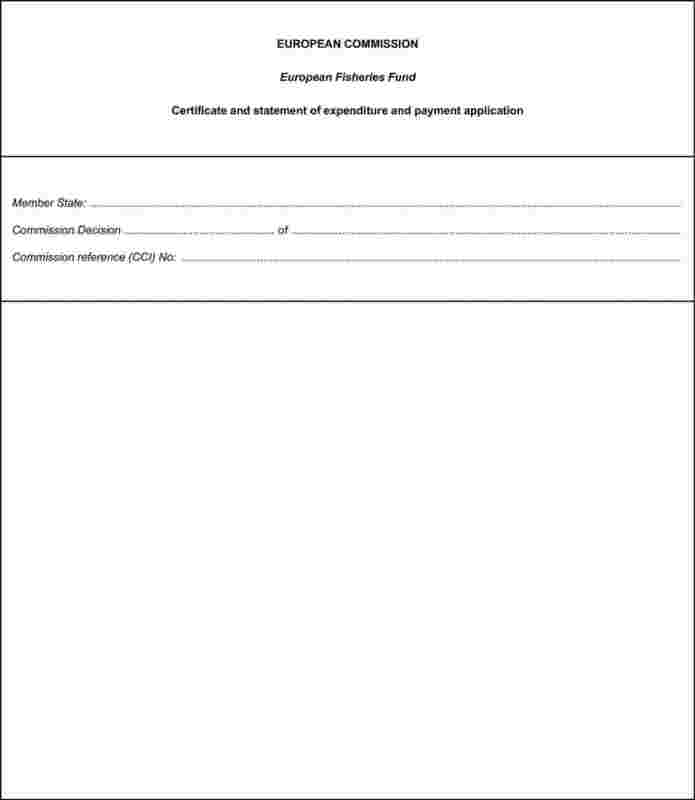 In accordance with Directive 1999/93/EC of the European Parliament and of the Council of 13 December 1999 on a Community framework for electronic signatures (6), taking account of the level of security and confidentiality required for the financial management of funds from the EFF, of the state of the art and of a cost-benefit analysis, it is necessary to require the use of an electronic signature. In order to ensure the quick development and proper functioning of the common computer system, the cost of its development should be financed by the general budget of the European Communities under Article 46(1) of the basic Regulation, and the costs of the interface with national, regional, and local computer systems should be eligible for a financial contribution from EFF under Article 46 of that Regulation. In the light of Directive 95/46/EC of the European Parliament and of the Council of 24 October 1995 on the protection of individuals with regard to the processing of personal data and on the free movement of such data (7) and Regulation (EC) No 45/2001 of the European Parliament and of the Council of 18 December 2000 on the protection of individuals with regard to the processing of personal data by the Community institutions and bodies and on the free movement of such data (8), it is necessary to provide, in relation to the information and publicity measures and the audit work under this Regulation, that the Commission and the Member States should prevent any unauthorised disclosure of, or access to, personal data, and to specify the purpose for which the Commission and the Member States may process such data. Commission Regulations (EC) No 2722/2000 of 13 December 2000 establishing the conditions under which the Financial Instrument for Fisheries Guidance (FIFG) may make a contribution towards the eradication of pathological risks in aquaculture (9), (EC) No 908/2000 of 2 May 2000 laying down detailed rules for calculating aid granted by Member States to producer organisations in the fisheries and aquaculture sector (10) and (EC) No 366/2001 of 22 February 2001 laying down detailed rules for implementing the measures provided for in Council Regulation (EC) No 2792/1999 (11) should be repealed. For operational programmes for which the total eligible public expenditure does not exceed EUR 90 million at 2004 prices, specific arrangements are laid down in Article 28(2) and Articles 51, 52 and 53. 1. The content of the operational programme, referred to in Article 20 of the basic Regulation, shall be established in accordance with Part A of Annex I to this Regulation and the financing plan as set out in Part B of that Annex. The ex ante evaluation, referred to in Article 48 of the basic Regulation, shall be annexed to the operational programme. 2. Member States shall make available to the Commission an electronic version of their operational programme, updated following each programme revision. Member States shall submit to the Commission requests for programme revisions, referred to in Article 18 of the basic Regulation, by electronic means in accordance with Article 65 of this Regulation. Member States shall submit to the Commission their requests for revision of the operational programme, affecting the European Fisheries Fund (EFF) contribution for the ongoing year, by 30 September of that year at the latest. 1. After the permanent cessation of fishing activities, the fishing vessel concerned shall be permanently deleted from the fishing fleet register of the Community and, where appropriate, the fishing licence associated with it shall be permanently cancelled. 2. The operational programme shall specify the methods for calculating the premiums granted under Article 23 of the basic Regulation. 3. Where the permanent cessation of fishing activities of a fishing vessel is achieved by its reassignment as referred to in Article 23(1)(b) of the basic Regulation, Member States shall adjust the level of the premium accordingly, taking into account criteria such as the market value of the fishing licence for the vessel and the residual value of the vessel. 4. If a fishing vessel is lost between the date of the decision to grant the premium and the actual date of permanent cessation of fishing activities, the management authority shall make a financial correction for the amount of the compensation paid by the insurance. 1. The operational programme shall specify the methods for calculating the premiums granted under Article 24 of the basic Regulation. 2. For the purposes of Article 24(2) of the basic Regulation, ‘Community financial assistance allocated to the sector’ shall mean the EFF contribution to the operational programme of the Member Sate concerned. 1. For the purposes of Article 25 of the basic Regulation, the managing authority shall be responsible for assessing compliance with paragraphs 2 to 5 of this Article and shall provide the Commission with all relevant documents upon request. 2. The total eligible expenditure to be supported per fishing vessel over the entire programming period under Article 25 of the basic Regulation, except under paragraph 6(e) of that Article, shall not exceed a maximum amount established on the basis of objective criteria, such as those listed in Article 23(3) of that Regulation and included in the operational programme. all the vessels belonging to the same group do not exceed fifty in number. 4. The exits from the fishing fleet of fishing capacity with public aid shall not be taken into account in the calculation of the 20 % reduction in power that may be achieved by a group of vessels as provided for in Article 25(4) of the basic Regulation. 5. Financial support granted under Article 25(6)(e) of the basic Regulation shall be granted only for equipment and modernisation works for the protection of catch and gear from wild predator species protected under Council Directives 79/409/EEC (13) and 92/43/EEC (14). 1. Where the private financial participation rate is reduced in accordance with Article 26(2) of the basic Regulation, the rate of the public contribution shall be increased accordingly. The contribution from the EFF shall be calculated in accordance with the rates provided for in Article 53 of the basic Regulation in relation to such resulting public contribution. 2. The operational programme shall specify the methods for calculating premiums granted under Articles 26(3) and 26(4) of the basic Regulation in favour of small- scale coastal fishing. 3. For the purposes of Article 26(4)(b) of the basic Regulation ‘fisheries products’ shall mean fishery products originating from the catches of small-scale coastal fishing vessels. 1. The operational programme shall specify the methods for calculating the socio-economic compensation for the management of the Community fishing fleet granted under Article 27 of the basic Regulation. 2. Support provided for in Article 27(1)(d) of the basic Regulation for early retirement shall be eligible for a contribution from the EFF, even where it is paid to the beneficiaries after 31 December 2015, provided that it has been secured for this purpose in a blocked account before that date. Support under Article 28(6) of the basic Regulation may cover the costs of assessments provided for in Council Directive 85/337/EEC (15). ‘traditional aquaculture’: time-honoured practices which are linked to the social and cultural heritage of a given area. 2. The support provided for in Article 29 of the basic Regulation, may cover aquaculture service vessels. Fishing vessels as defined in Article 3(c) of Council Regulation (EC) No 2371/2002 (16) shall not be regarded as aquaculture service vessels even where they are exclusively used in aquaculture. 3. Without prejudice to Article 35(6) of the basic Regulation, support under Article 29 of that Regulation may cover investments related to on-farm retail trade where such trade forms an integral part of the aquaculture farm. 4. Where Member States use the possibility provided for in Article 29(1)(a) of the basic Regulation, they shall put in place mechanisms to make available to the management authority the results of prospective market analysis on aquaculture species. 5. For the measures provided for in Article 29 of the basic Regulation, Member States shall describe in their operational programme how aid is to be prioritised to micro and small enterprises. 1. Where support is granted to beneficiaries for the purposes referred to in Article 30 of the basic Regulation, Member States shall check that those beneficiaries comply with the aqua-environmental commitments at the latest three years from the date of approval of the operation and at the end of the implementation of the operation. 2. Support provided for in Article 30(2)(b) of the basic Regulation, shall concern only costs for participation in a Community eco-management and audit scheme (EMAS) that are prior to the approval of the scheme for an individual enterprise. 3. For the purpose of Article 30(2)(c) of the basic Regulation, ‘organic aquaculture’ shall mean the aquaculture activities producing farmed aquatic species in accordance with the organic production method within the meaning of Article 2 of Council Regulation (EEC) No 2092/91 (17) and which bear indications to that effect. Until the adoption of detailed production rules by the Community, including rules on conversion, applicable to organic aquaculture, national rules or, in the absence thereof, private standards, applicable to organic aquaculture, accepted or recognised by the Member States, shall apply. 4. Support provided for in Article 30(2)(d) of the basic Regulation, may be granted only for specific restrictions or requirements for Nature 2000 areas, imposed by the relevant national measures for the implementation of the Directives 79/409/EEC and 92/43/EEC. 5. For the purpose of Article 30(3) of the basic Regulation, ‘normal good aquaculture practice’ shall mean compliance with binding legislation, whether it relates to health, veterinary or environmental matters, and the use of production protocols that prevent the wastage of resources and avoidable pollution. for non-exotic diseases in aquaculture as listed in the Annex of Decision 90/424/EEC, eradication programmes drawn up and approved pursuant to Article 44(2) of Directive 2006/88/EC. 2. The managing authority of the operational programme shall decide whether it will contribute to the financing of control measures referred to in paragraph 1(a), or an eradication programme referred to in paragraph 1(b), and adopt the detailed arrangements for its financial participation before submitting the measures or the programme, respectively, in accordance with the provisions of Decision 90/424/EEC. 3. If the Commission does not approve, in accordance with Article 24 of Decision 90/424/EC, the control measures or the eradication programme referred to in paragraph 1 of this Article, the committed contribution shall be immediately returned to the budget of the operational programme. 4. If the value of the eligible costs in the action approved by the Commission in accordance with Article 24 of Decision 90/424/EC is less than the sum committed by the management authority, the difference released in this way may be reused by the Member State for its operational programme. 5. Support provided for in Article 32 of the basic Regulation, shall not cover surveillance activities intended to demonstrate freedom from a disease in order to obtain the recognition of the officially disease-free status or fixed costs such as the costs of official veterinary services. 1. For the purpose of Article 33 of the basic Regulation, ‘vessels operating exclusively in inland waters’ shall mean vessels engaged in commercial fishing in inland waters and not included in the Community fishing fleet register. 2. For the investments provided for in the second subparagraph of Article 33(2) and Article 25 of the basic Regulation, vessels of less than 12 metres, not using towed gear and operating in inland fishing, may be supported with the same aid intensity as provided for small-scale coastal vessels referred to in Article 26 of that Regulation. 3. Member States shall determine in their operational programmes how they will ensure that the investments supported under Article 33 of the basic Regulation do not jeopardise the equilibrium between the fleet size and the corresponding fish resources available. 1. Investments for the extractions from fishmeal or fish oil of dioxin or other substances harmful to human health may be supported by the EFF under Article 34 of the basic Regulation even where the final products are intended to be used and processed for purposes other than human consumption. 2. For the measures provided for in Article 35 of the basic Regulation, Member States shall describe in their operational programmes how aid will be prioritised to small and micro enterprises. 1. Support provided for in Article 37 of the basic Regulation shall not cover costs related to exploratory fishing. the restructuring of producers' organisations in order to increase their efficiency in line with market requirements. 3. The support referred to in paragraph 2(b) of this Article shall be degressive over three years following the date of the specific recognition under Article 12 of Regulation (EC) No 104/2000. 1. Support provided for in point (a) of the first subparagraph of Article 38(2) of the basic Regulation shall concern measures for the construction and installation of artificial reefs or other facilities made up of long lasting elements. Support may cover work preliminary to installation, including studies, components, signalling, transport and the assembly of the facilities and scientific monitoring. 2. Support provided for in Article 38(2) of the basic Regulation shall not cover fish aggregating devices. 3. Support provided for in point (c) of the first subparagraph of Article 38(2) of the basic Regulation may cover the expenditure on the necessary conservation measures for sites belonging to the Nature 2000 European Ecological Network. Support may cover the preparation of management plans, strategies and schemes, infrastructure including depreciation and equipment for reserves, training and education for the employees of reserves as well as relevant studies. 4. Support provided for in point (c) of the first subparagraph of Article 38(2) of the basic Regulation shall not cover compensation for rights foregone, loss of income and salaries of employees. 5. For the purposes of second subparagraph of Article 38(2) of the basic Regulation, ‘direct restocking’ shall mean the activity of releasing live aquatic organisms, whether the animals are produced in hatcheries or fished elsewhere. Where support is given for investments to restructure landing sites and to improve the conditions for fish landed by coastal fishers in existing landing sites, as provided for in the second subparagraph of Article 39(1) of the basic Regulation, Member States shall ensure compliance with the relevant sanitary rules and the enforcement of control measures in those landing sites. the organisation of and participation in trade fairs and exhibitions. 2. As regards products protected under Council Regulation (EC) No 510/2006 (20), support may be granted for their promotion only from the date on which the name has been entered in the register as provided for in Article 7 of that Regulation. 1. No support shall be granted under Article 41 of the basic Regulation for exploratory fishing. 2. Where support is given for a pilot project, as provided for in Article 41 of the basic Regulation, the managing authority shall ensure that the pilot project includes adequate scientific follow up and that an adequate qualitative assessment of the technical reports referred to in Article 41(3) of that Regulation is made. 3. Pilot projects shall not be of a directly commercial nature. Any profit generated during the implementation of a pilot project shall be deducted from the public aid granted to the operation. 4. Where the total costs of a pilot project exceed EUR 1 million, the managing authority shall, prior to its approval, require an assessment by an independent scientific body. Support, as provided for in Article 42 of the basic Regulation, may be granted for the modification of a fishing vessel after its reassignment only if that vessel has been deleted permanently from the fishing fleet register and, where appropriate, the fishing licence associated with it has been permanently cancelled. implementing inter-regional and trans-national cooperation among the groups in fisheries areas as referred to in Article 44(1)(h) of the basic Regulation, mainly through networking and disseminating best practices with a view to achieving the objective referred to in Article 43(2)(d) of that Regulation. 1. The operational programme shall specify the procedures and the criteria for selecting the fisheries areas. Member States shall decide how they will apply Articles 43(3) and (4) of the basic Regulation. 2. The fisheries areas selected do not necessarily have to coincide with a national administrative area or with zones established for the purposes of eligibility under the objectives of the Structural Funds. 1. A group, as referred to in Article 45(1) of the basic Regulation, shall be composed in such a way that it is able to draw up and implement a development strategy in the area concerned. The relevance and effectiveness of the partnership shall be assessed on the basis its composition, as well as its transparency and clarity in the allocation of tasks and responsibilities. The capacity of the partners to carry out the tasks assigned to them and the effectiveness and decision-making shall be guaranteed. The partnership shall comprise, including at the decision-making level, representatives of the fisheries sector and of other relevant local socio-economic sectors. comes together in a legally constituted common structure, the formal constitution of which guarantees the satisfactory operation of the partnership. with regard to paragraph 2(b), in terms of the ability of the common structure to administer the funds. 4. The groups for the implementation of local development strategies shall be selected no later than four years from the date of the approval of the operational programme. Longer time limits may be granted where the managing authority organises more than one selection procedure for the groups. the management arrangements and the procedures for the mobilisation and circulation of financial flows as far as the beneficiary; it shall describe in particular how the groups are integrated into the management, monitoring and control systems. be complementary to other interventions made in the area concerned. 1. Notwithstanding Article 45(2) of the basic Regulation, the group shall choose the operations to be financed under the local development strategy. 2. If the group is entrusted with the administration of public funds, it shall create a separate account for the implementation of the local development strategy. the part of the cost of vehicles not directly linked to the operation concerned. Member States shall forward the interim evaluations referred to in Article 49 of the basic Regulation by 30 June 2011 at the latest. The Commission may decide to interrupt the payment deadline, in accordance with Article 88 of the basic Regulation, where a Member State has not complied with that obligation. an indication of how the information and publicity measures are to be evaluated in terms of visibility and awareness of the operational programme and of the role played by the Community. 2. For the operational programmes referred to in Article 2, paragraphs 1(c) and (d) of this Article shall not apply. the arrangements for the information and publicity measures referred to in point (d) of the second paragraph of Article 31 of this Regulation including, where applicable, the electronic address where such data may be found. The annual report on implementation covering the year 2010 and the final report on implementation referred to in Article 67 of the basic Regulation shall contain a chapter assessing the results of the information and publicity measures in terms of visibility and awareness of the operational programme and of the role played by the Community, as provided for in paragraph 1(d) of this Article. 1. For the purposes of Article 51(2)(a) of the basic Regulation, the managing authority shall ensure that the operational programme is disseminated widely with details of the financial contribution from the EFF and that it is made available to all interested parties. The managing authority shall ensure, in addition, that information on the financing opportunities offered by joint assistance from the Community and the Member State through the operational programme is disseminated as widely as possible. the contacts at national, regional or local level who can provide information on the operational programme. 3. The managing authority shall inform potential beneficiaries of the publication provided for in point (d) of the second paragraph of Article 31. The managing authority shall inform beneficiaries that acceptance of funding is also an acceptance of their inclusion in the list of beneficiaries published in accordance with point (d) of the second paragraph of Article 31. For the purposes of Article 51(2)(c) of the basic Regulation, the managing authority shall ensure that the information and publicity measures for the public are implemented and that they aim at the widest possible media coverage using various forms and methods of communication at the appropriate territorial level. the publication, electronically or otherwise, of the list of beneficiaries, the names of the operations and the amount of public funding allocated to the operations. Participants in operations supported by EFF and aimed at improving professional skills and training as well as beneficiaries receiving support for early departure from the fishing sector, including early retirement, as provided for under Article 27(1)(d) of the basic Regulation, shall not be named. 1. For the purposes of Article 51 of the basic Regulation, the beneficiary shall be responsible for informing the public, by means of the measures laid down in paragraphs 2, 3 and 4 of this Article, about the assistance obtained from the EFF. 2. Where the total eligible cost of an operation co-financed by the EFF, exceeds EUR 500 000 and consists in the financing of infrastructure or of construction operations the beneficiary shall put up a billboard at the site of the operation during its implementation. The information referred to in Article 33 shall take up at least 25 % of the billboard. When the operation is completed the billboard shall be replaced by the permanent explanatory plaque referred to in paragraph 3. 3. Where the total eligible cost of the operation exceeds EUR 500 000 and consists in the purchase of a physical object or the financing of infrastructure or of construction operations, the beneficiary shall put up a permanent explanatory plaque that is visible and of significant size no later than six months from the date of completion of the operation. The plaque shall state the type and name of the operation in addition to the information referred to in Article 33. The information referred to in that Article shall take up at least 25 % of the plaque. An explanatory plaque shall also be installed at the locations of the groups financed under priority axis 4 of the basic Regulation. 4. In appropriate cases, the beneficiary shall ensure that those taking part in an operation co-financed by the EFF have been informed of that funding. The beneficiary shall provide a clear notice to the effect that the operation being implemented has been selected under an operational programme co-financed by the EFF. Any document, including any attendance or other certificate, concerning such an operation shall include a statement to the effect that the operational programme was co-financed by the EFF. a statement chosen by the managing authority, highlighting the added value of the intervention of the Community, and preferably: ‘Investing in sustainable fisheries’. 2. For small promotional objects, paragraph 1(b) and (c) shall not apply. 1. 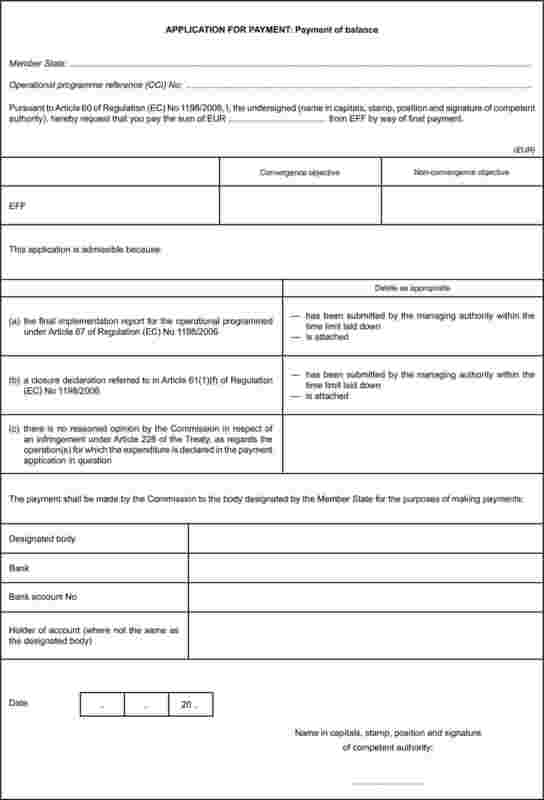 Pursuant to Article 55(8) of the basic Regulation, as part of an operational programme, the EFF may co-finance expenditure in respect of an operation comprising contributions to support financial engineering instruments for enterprises, primarily to small and medium-sized enterprises (SMEs), including micro enterprises, as defined in Commission Recommendation 2003/361/EC (21) as of 1 January 2005, such as venture capital funds, guarantee funds and loan funds including through holding funds. The financial engineering instruments shall be in the form of actions which make repayable investments or provide guarantees for repayable investments, or both. The conditions set out in Articles 35, 36 and 37 shall apply to them. 2. The statement of expenditure, as regards financial engineering instruments, shall include the total expenditure paid in establishing or contributing to such instruments. However, at the partial or final closure of the operational programme, the eligible expenditure shall be the total of any payments for investment in enterprises from each of the financial engineering instruments referred to in paragraph 1 or any guarantees provided, including amounts committed as guarantees by guarantee funds and eligible management costs. The corresponding statement of expenditure shall be corrected accordingly. 3. Interest generated by payments from the operational programme to financial engineering instruments shall be used to finance financial engineering instruments for small and medium-sized enterprises, including micro enterprises. 4. Resources returned to the operation from investments undertaken by financial engineering instruments or left over after all guarantees have been honoured shall be reused by the competent authorities of the Member States concerned for the benefit of small and medium-sized enterprises, including micro enterprises. 1. When the EFF finances operations comprising financial engineering instruments, including those organised through holding funds, a business plan shall be submitted by the co-financing partners or shareholders or by their duly authorised representative. That business plan shall be assessed and its implementation monitored by or under the responsibility of the Member State or the managing authority. The assessment of the economic viability of the investment activities of the financial engineering instruments shall take into account all sources of income of the enterprises concerned. the winding-up provisions of the financial engineering instrument, including the reutilisation of resources returned to the financial engineering instrument from investments or left over after all guarantees have been honoured, attributable to the contribution from the operational programme. 3. Financial engineering instruments, including holding funds, shall be set up as independent legal entities governed by agreements between the co-financing partners or shareholders or as a separate block of finance within an existing financial institution. Where the financial engineering instrument is established within a financial institution, it shall be set up as a separate block of finance, subject to specific implementation rules within the financial institution, stipulating, in particular, that separate accounts are kept, which distinguish the new resources invested in the financial engineering instrument, including those contributed by the operational programme, from those initially available in the institution. The Commission shall not become a co-financing partner or shareholder in financial engineering instruments. 4 % of the capital contributed from the operational programme or the holding fund to instruments directed at micro enterprises. 5. The terms and conditions for contributions from the operational programme to financial engineering instruments shall be set out in a funding agreement, to be concluded between the duly mandated representative of the financial engineering instrument and the Member State or the managing authority. the winding-up provisions of the financial engineering instrument, including the reutilisation of resources returned to the financial engineering instrument from investments or left over after all guarantees have been honoured, that are attributable to the contribution from the operational programme. 7. The managing authority shall take precautions to minimise any distortions of competition in the venture capital or lending markets. Returns from equity investments and loans, less a pro rata share of the management costs and performance incentives, may be allocated preferentially to investors operating under the market economy investor principle up to the level of remuneration laid down in the bylaws of the financial engineering instruments and they shall then be allocated proportionally among all co-financing partners or shareholders. a financial institution without a call for proposals, if this is pursuant to a national law compatible with the Treaty. 2. When the EFF finances financial engineering instruments organised through holding funds, the Member State or the managing authority, shall conclude a funding agreement with the holding fund setting out the funding arrangements and objectives. The funding agreement shall, where appropriate, take account of the conclusions of an evaluation of gaps between the supply of such instruments to, and demand for such instruments by, SMEs. the winding-up provisions of the holding fund, including the reutilisation of resources returned to the financial engineering instrument from investments made or left over after all guarantees have been honoured which are attributable to the contribution from the operational programme. 4. The terms and conditions for contributions to venture capital funds, guarantee funds, and loan funds from holding funds supported by the operational programme shall be set out in a funding agreement, to be concluded between the venture capital funds, guarantee fund and loan fund, on one hand, and the holding fund, on the other. The funding agreement shall include at least the elements listed in Article 35(6). Financial engineering instruments, other than holding funds, shall invest in enterprises, primarily in SMEs. Such investments may only be made at the establishment, in the early stages, including seed capital, or on the expansion of those enterprises, and only in activities which the managers of the financial engineering instruments judge potentially economically viable. 1. Where one or more of the tasks of a managing authority or certifying authority are performed by an intermediate body, the relevant arrangements shall be formally recorded in writing. 2. The provisions of this Regulation concerning the managing authority and certifying authority shall apply to the intermediate body. 1. For the purposes of the selection and approval of operations, under Article 59(a) of the basic Regulation, the managing authority shall ensure that beneficiaries are informed of the specific conditions concerning the products or services to be delivered under the operation, the financing plan, the time limit for execution, and the financial and other information to be kept and communicated. It shall satisfy itself that the beneficiary has the capacity to fulfil those obligations before the approval decision is taken. 2. The verifications to be carried out by the managing authority under Article 59(b) of the basic Regulation shall cover the administrative, financial, technical and physical aspects of operations, as appropriate. Verifications shall ensure that the expenditure declared is real, the products or services have been delivered in accordance with the approval decision, the applications for reimbursement by the beneficiary are correct and that expenditure complies with Community and national rules. They shall include procedures to avoid double-financing of expenditure with other Community or national schemes and with other programming periods. on-the-spot verifications of individual operations. 3. Where on-the-spot verifications under paragraph 2(b) are carried out on a sample basis for the operational programme, the managing authority shall keep records describing and justifying the sampling method and identifying the operations or transactions selected for verifications. The managing authority shall determine the size of the sample in order to achieve reasonable assurance as to the legality and regularity of the underlying transactions having regard to the level of risk identified by the managing authority for the type of beneficiaries and operations concerned. The managing authority shall review the sampling method each year. 4. The managing authority shall establish written standards and procedures for the verifications carried out under paragraph 2 and shall keep records for each verification, stating the work performed, the date and the results of the verification and the measures taken in respect of any irregularities detected. 5. Where the managing authority is also a beneficiary under the operational programme, arrangements for the verifications referred to in paragraphs 2, 3 and 4 of this Article shall ensure the adequate separation of functions in accordance with Article 57(1)(b) of the basic Regulation. 1. The accounting records of operations and the data on implementation, referred to in Article 59(c) of the basic Regulation, shall include at least the information set out in Annex III to this Regulation. That information shall be disaggregated where relevant on the basis of age and gender of beneficiaries. 2. The managing, certifying and audit authorities and the bodies, referred to in Article 61(3) of the basic Regulation, shall have access to the information referred to in paragraph 1 of this Article. 3. At the written request of the Commission, the Member State shall provide the Commission with the appropriate information referred to in paragraph 1 within fifteen working days of receipt of the request or any other agreed period, for the purpose of carrying out documentary and on-the-spot checks. The Commission may require the information referred to in paragraph 1 at the level of the operations, measures, priority axes or of the operational programme. it contains, in respect of each operation, as appropriate, the technical specifications and financing plan, documents concerning the grant approval, documents relating to public procurement procedures, progress reports and reports on verifications and audits carried out. 1. The audits referred to in Article 61(1)(b) of the basic Regulation shall be carried out each 12-month period from 1 July 2008 on a sample of operations selected by a method established or approved by the audit authority in accordance with Article 43 of this Regulation. The audits shall be carried out on-the-spot on the basis of documentation and records held by the beneficiary. the public contribution has been paid to the beneficiary in accordance with Article 80 of the basic Regulation. 3. Where any problems detected appear to be systemic in nature and therefore entail a risk for other operations under the operational programme, the audit authority shall ensure that further examinations are carried out, including additional audits where necessary, to establish the scale of any such problems. The necessary preventive and corrective action shall be taken by the responsible authorities. 4. Only expenditure falling within the scope of the audit in accordance with paragraph 1 shall be counted towards the amount of expenditure audited, for the purposes of reporting in the tables in point 9 of Part A of Annex VI and point 9 of Part A of Annex VII. 1. The sample of operations to be audited each 12-month period shall in the first instance be based on a random statistical sampling method as set out in paragraphs 2, 3 and 4. Additional operations may be selected as a complementary sample as set out in paragraphs 5 and 6. 2. The method used to select the sample and to draw conclusions from the results shall take account of internationally accepted audit standards and be documented. Having regard to the amount of expenditure, the number and type of operations and other relevant factors, the audit authority shall determine the appropriate statistical sampling method to apply. The technical parameters of the sample shall be determined in accordance with Annex IV. 3. The sample to be audited in each 12-month period shall be selected from those operations for which expenditure has been declared to the Commission for the operational programme during the year preceding the year in which the annual control report, provided for in Article 61(1)(e)(i) of the basic Regulation, is communicated to the Commission. For the first twelve month period, the audit authority may decide to group the operations for which expenditure has been declared to the Commission in 2007 and 2008 as a basis for the selection of the operations to be audited. 4. The audit authority shall draw conclusions on the basis of the results of the audits relating to expenditure declared to the Commission during the period referred to in paragraph 3 and communicate them to the Commission in the annual control report. In operational programmes for which the projected error rate is above the materiality level, the audit authority shall analyse its significance and take the necessary actions, including making appropriate recommendations which shall be communicated in the annual control report. 5. The audit authority shall regularly review the coverage provided by the random sample, having regard in particular to the need to have sufficient audit assurance for the declarations to be provided at partial and final closure of the operational programme. It shall decide on the basis of its professional judgment whether it is necessary to audit a complementary sample of additional operations in order to take account of specific risk factors identified and to guarantee for the programme sufficient coverage of different types of operation, beneficiaries, intermediate bodies and priority axes. 6. The audit authority shall draw conclusions on the basis of the results of the audits of the complementary sample and communicate them to the Commission in the annual control report. Where the number of detected irregularities is high or where systemic irregularities have been detected, the audit authority shall analyse the significance thereof and take the necessary actions including making recommendations which shall be communicated in the annual control report. The results of the audits on the complementary sample shall be analysed separately from those of the random sample. In particular, irregularities detected in the complementary sample shall not be taken into account when the error rate of the random sample is calculated. 1. The audit strategy referred to in Article 61(1)(c) of the basic Regulation shall be established in accordance with the model set out in Annex V to this Regulation. It shall be updated and reviewed annually and, if necessary, during the course of the year. 2. The annual control report and the opinion referred to in Article 61(1)(e)(i) of the basic Regulation shall be based on the systems audits and audits of operations carried out under Article 61(1)(a) and (b) of that Regulation in accordance with the audit strategy for the operational programme and shall be drawn up in accordance with the models set out in Annex VI to this Regulation. 3. The closure declaration referred to in Article 61(1)(f) of the basic Regulation shall be based on all the audit work carried out by or under the responsibility of the audit authority in accordance with the audit strategy. The closure declaration and final control report shall be drawn up in accordance with the model set out in Annex VII to this Regulation. 4. If there is limitation in the scope of examination or if the level of irregular expenditure detected does not allow the provision of a unqualified opinion for the annual opinion referred to in Article 61(1)(e) of the basic Regulation or in the closure declaration referred to in Article 61(1)(f) of that Regulation, the audit authority shall give the reasons and estimate the scale of the problem and its financial impact. 1. For the purposes of Article 87 of the basic Regulation, the managing authority shall ensure that a record is available of the identity and location of bodies holding the supporting documents relating to expenditure and audits, which includes all documents required for an adequate audit trail. 2. The managing authority shall ensure that the documents referred to in paragraph 1 of this Article are made available for inspection by, and extracts or copies thereof are supplied to, persons and bodies entitled thereto, including at least authorised staff of the managing authority, certifying authority, intermediate bodies, audit authority and the bodies referred to in Article 61(3) of the basic Regulation and authorised officials of the Community and their authorised representatives. 3. The managing authority shall keep the information necessary for the purposes of evaluation and reporting, including the information referred to in Article 40, in relation to operations referred to in Article 87(2) of the basic Regulation for the whole of the period referred to in paragraph (1)(a) of that Article. documents existing in electronic version only. 5. The procedure for certification of conformity of documents held on commonly accepted data carriers with the original document shall be laid down by the national authorities and shall ensure that the versions held comply with national legal requirements and can be relied on for audit purposes. 6. Where documents exist in electronic version only, the computer systems used must meet accepted security standards that ensure that the documents held comply with national legal requirements and may be relied on for audit purposes. 1. Certified statements of expenditure and applications for payment, as referred to in Article 60(a) of the basic Regulation, shall be drawn up in the format set out in Annex IX to this Regulation and transmitted to the Commission. a statement of amounts to be recovered as at 31 December of the preceding year, classified by the year in which recovery orders were issued. 3. In order to proceed to the partial closure of the operational programme, the certifying authority shall submit to the Commission a statement of expenditure referred to in Article 85 of the basic Regulation in the format set out in Annex xI to this Regulation. The description of the management and control systems for the operational programme referred to in Article 71(1) of the basic Regulation shall contain information on the points referred to in Article 57 of that Regulation, and the information set out in Articles 48 and 49 of the present Regulation. That information shall be submitted in accordance with the model set out in Part A of Annex XII to this Regulation. the system for keeping the detailed accounting records of operations and data on implementation referred to in Article 40(1) under the operational programme. the procedures for the preparation of the annual control report and the closure declaration. 1. The report, referred to in Article 71(2) of the basic Regulation, shall be based on an examination of the systems description, of relevant documents concerning the systems and of the system for keeping accounting records and data on the implementation of operations and on interviews with the staff in the main bodies considered important by the audit authority, or other body responsible for the report, in order to complete, clarify or verify the information. 2. The opinion on the compliance of the systems, referred to in Article 71(2) of the basic Regulation, shall be drawn up in accordance with the model set out in Part B of Annex XII to this Regulation. 3. Where the management and control system concerned is essentially the same as that in place for assistance approved under Council Regulation (EC) No 1083/2006 (22), account may be taken of the results of audits carried out by national and Community auditors in relation to that system for the purposes of establishing the report and opinion under Article 71(2) of the basic Regulation. 1. For the operational programmes referred to in Article 2 of this Regulation, the audit authority shall not be required to present to the Commission an audit strategy as provided for in Article 61(1)(c) of the basic Regulation. that it will carry out its own on-the-spot audits only if there is evidence to suggest shortcomings in the system affecting expenditure certified to the Commission in a year for which an opinion under Article 61(1)(e)(ii) of the basic Regulation has been provided which contains no reservation in respect of such shortcomings. 3. Where the Commission reaches the conclusion referred to in paragraph 2 of this Article, it shall inform the Member State concerned accordingly. the functions of the audit authority under Article 61 of the basic Regulation. 2. Where a Member State exercises the option referred to in paragraph 1 of this Article, it shall not be required to designate a certifying authority and an audit authority, as provided for in Article 58(1)(b) and (c) of the basic Regulation. 3. Where a Member State exercises the option referred to in paragraph 1 of this Article, the provisions of Article 71 of the basic Regulation shall apply mutatis mutandis. 1. This Article shall apply to operational programmes in respect of which a Member State has exercised the option provided for in Article 52(1). 2. The verifications referred to in Article 39(2) shall be carried out by the national bodies referred to in Article 52(1). 3. The audits of operations referred to in Article 61(1)(b) of the basic Regulation shall be carried out in accordance with national procedures. Articles 42 and 43 of this Regulation shall not apply. 4. Article 44 (2) to (5) shall apply mutatis mutandis to the preparation of the documents issued by the national bodies referred to in Article 52(1). The annual control report and the annual opinion shall be drawn up following, as appropriate, the models set out in Annex VI. 5. The obligations laid down in Article 46(2), shall be carried out by the national bodies referred to in Article 52(1). The statement of expenditure shall be drawn up following the models set out in Annexes IX and XI. 6. The information to be included in the description of the management and control systems referred to in Articles 47, 48 and 49 shall, where applicable, include the information concerning the national bodies referred to in Article 52(1). ‘bankruptcy’: insolvency proceedings as defined in Article 2 (a) of Council Regulation (EC) No 1346/2000 (24). 1. Without prejudice to the obligations under Article 70 of basic Regulation, within two months following the end of each quarter, Member States shall report to the Commission any irregularities which have been the subject of a primary administrative or judicial finding. cases which are detected and corrected by the managing or certifying authority before any payment to the beneficiary of the public contribution and before the inclusion of the expenditure concerned in a statement of expenditure submitted to the Commission. However, irregularities preceding a bankruptcy and cases of suspected fraud must be reported. 3. Where some of the information referred to in paragraph 1, and in particular information concerning the practices employed in committing the irregularity and the manner in which it was discovered, is not available, Member States shall as far as possible supply the missing information when submitting subsequent quarterly reports of irregularities to the Commission. 4. If national provisions provide for the confidentiality of investigations, the communication of the information shall be subject to the authorisation of the competent court or tribunal. 5. Where a Member State has no irregularities to report under paragraph 1, it shall inform the Commission of that fact within the time limit set out in that paragraph. they show that a new malpractice has been employed. 1. Within two months following the end of each quarter, Member States shall inform the Commission, with a reference back to any previous reports made under Article 55, of the procedures instituted with respect to all irregularities previously notified and of any important changes resulting from them. any abandonment of criminal prosecutions. Member States shall report to the Commission administrative or judicial decisions, or the main points thereof, concerning the termination of such procedures and shall state in particular whether or not the findings are such that fraud is suspected. In the case referred to in point (d), Member States shall, as far as possible, notify the Commission before a decision is taken. 2. Where a Member State considers that an amount cannot be recovered or is not expected to be recovered, it shall inform the Commission, in a special report, of the amount not recovered and the facts relevant to the decision on apportionment of the loss under Article 70(2) of basic Regulation. That information shall be sufficiently detailed so as to allow the Commission to take such decision as soon as possible, after consulting the authorities of the Member States concerned. an outline description of the measures taken by the Member State, with an indication of their dates, to recover the relevant amount. 3. In the case referred to in paragraph 2, the Commission may expressly request the Member State to continue the recovery procedure. Where the competent authorities of a Member State decide, at the express request of the Commission, to initiate or continue judicial proceedings with a view to recovering amounts unduly paid, the Commission may undertake to reimburse the Member State all or part of the judicial costs and costs arising directly from the proceedings, on presentation of documentary evidence, even where the proceedings are unsuccessful. 1. The Commission shall maintain appropriate contacts with the Member States concerned for the purpose of supplementing the information supplied on the irregularities referred to in Article 55, on the procedures referred to in Article 57, and, in particular, on the possibility of recovery. 2. Independently of the contacts referred to in paragraph 1 the Commission shall inform Member States where the nature of the irregularity is such as to suggest that identical or similar practices could occur in other Member States. 3. The Commission shall organise information meetings at Community level for representatives of the Member States in order to examine with them the information obtained pursuant to Articles 55, 56 and 57, and paragraph 1 of this Article. The examination shall focus on the lessons to be learned from the information in connection with irregularities, preventive measures and legal proceedings. 4. At the request of a Member State or the Commission, the Member State and the Commission shall consult with one another for the purpose of closing any loopholes prejudicial to Community interests which become apparent in the course of the enforcement of provisions in force. The Commission may use any information of a general or operational nature communicated by Member States under this Regulation to perform risk analyses, and may, on the basis of the information obtained, produce reports and develop early-warning systems serving to identify risks more effectively. The Commission shall regularly inform the Member States, in the framework of the advisory committee for the coordination of fraud prevention set up by Commission Decision 94/140/EC (25), of the order of magnitude of the funds involved in the irregularities which have been discovered and of the various categories of irregularity, broken down by type and number. The committee referred to in Article 101 of the basic Regulation shall also be informed. 1. Where the irregularities relate to amounts of less than EUR 10 000 chargeable to the general budget of the European Communities, Member States shall not submit to the Commission the information provided for in Articles 55 and 57 unless the latter expressly requests it. However, in accordance with Article 60(f) of the basic Regulation, Member States shall keep accounts of amounts below that threshold that are recoverable and of amounts recovered or withdrawn following cancellation of the contribution to an operation and shall repay the recovered amounts to the general budget of the European Communities. Without prejudice to the obligations arising directly out of Article 70(1)(b) of the basic Regulation, the Member State and the Community shall share any losses arising from amounts below the threshold that cannot be recovered in accordance with the co-financing rate applicable to the operation concerned. The procedure set out in Article 57(2) of this Regulation shall not apply unless the Commission decides otherwise. The third subparagraph of this paragraph shall also apply to cases of bankruptcy exempted from the reporting obligation provided for in Article 55(1). 2. Member States which have not adopted the euro as their currency by the date the irregularity is established shall convert expenditure paid in national currency into euro, in accordance with Article 95 of the basic Regulation. Where the expenditure has not been registered in the accounts of the certifying authority, the most recent accounting exchange rate published electronically by the Commission shall be used. For the purpose of Articles 65 and 75 of the basic Regulation, a computer system for exchange of data shall be established as a tool for the exchange of all data relating to the operational programme. The exchange of data between each Member State and the Commission shall be carried out using that computer system, established by the Commission, which permits the secure exchange of data between the Commission and each Member State. The Member States shall be involved in the further development of the computer system for data exchange. the financial section of the annual and final reports on implementation in accordance with the model set out in point 3.3 of Annex XIV. the annual statement on withdrawn and recovered amounts and pending recoveries in accordance with the model set out in Annex X. 3. The data referred to in paragraphs 1 and 2 shall, where applicable, be transmitted in the format given in the Annexes. 1. The Commission and the authorities designated by the Member State pursuant to the basic Regulation as well as the bodies to which that task has been delegated shall record into the computer system for data exchange the documents for which they are responsible and any update thereto, in the required format. 2. Member States shall centralise and submit to the Commission requests for access rights to the computer system for data exchange. 3. Exchanges of data and transactions shall bear an electronic signature as defined in Article 2(1) of Directive 1999/93/EC. The Member States and the Commission shall recognise the legal effectiveness and admissibility of the electronic signature used in the computer system for data exchange as evidence in legal proceedings. 4. The cost of developing the computer system shall be financed by the general budget of the European Communities under Article 46(1) of the basic Regulation. Any costs of an interface between the common computer system for data exchange and national, regional and local computer systems and any costs of adapting national regional and local systems to requirements under the basic Regulation shall be eligible under Article 46(2) of that Regulation. 1. The computer system for data exchange shall be accessible to the Member States and the Commission either directly or via an interface for automatic synchronisation and recording of data with national, regional and local computer management systems. 2. The date taken into account for the forwarding of documents to the Commission shall be the date on which the Member State records the documents into the computer system for data exchange. 3. In cases of force majeure, and in particular of malfunctioning of the computer system for data exchange or a lack of a lasting connection, the Member State concerned may forward to the Commission the documents required by the basic Regulation in hard copy, in accordance with the model forms set out in Annex I and Annexes V to XIV to this Regulation. As soon as the cause of force majeure ceases, the Member State shall record the corresponding documents into the computer system for data exchange without delay. By way of derogation from paragraph 2, the date to be taken into account for submission shall be deemed to be the date of submission of the documents in hard copy. 1. Member States and the Commission shall take all necessary measures to prevent any unauthorised disclosure of, or access to, the information referred to in Article 40(1), information collected by the Commission in the course of its audits, and the information referred to in Chapter VIII. 2. The information referred to in Article 40(1), of this Regulation together with information collected by the Commission in the course of its audits, shall be used by the Commission for the sole purpose of fulfilling its responsibilities provided for in Article 72 of the basic Regulation. The European Court of Auditors and the European Anti-Fraud Office shall have access to that information. 3. The information referred to in Chapter VIII shall not be sent to persons, other than those in the Member States or within the Community institutions whose duties require that they have access to it, unless the Member State supplying such information has expressly so agreed. 4. Any personal data included in the information referred to in point (d) of the second paragraph of Article 31 shall only be processed for the purposes specified in that Article. Regulations (EC) No 2722/2000, (EC) No 908/2000 and (EC) No 366/2001 are repealed. References to the repealed Regulations shall be construed as references to this Regulation. The provisions of the Regulations repealed shall continue to apply to assistance approved under Regulation (EC) No 2792/1999. Done at Brussels, 26 March 2007. (1) OJ L 223, 15.8.2006, p. 1. (2) OJ L 161, 26.6.1999, p. 54. (3) OJ L 337, 30.12.1999, p. 10. Regulation as last amended by Regulation (EC) No 485/2005 (OJ L 81, 30.3.2005, p. 1). (4) OJ L 328, 24.11.2006, p. 14. (5) OJ L 178, 12.7.1994, p. 43. Regulation as amended by Regulation (EC) No 2035/2005 (OJ L 328, 15.12.2005, p. 8). (6) OJ L 13, 19.1.2000, p. 12. (7) OJ L 281, 23.11.1995, p. 31. Directive as amended by Regulation (EC) No 1882/2003 (OJ L 284, 31.10.2003, p. 1). (9) OJ L 314, 14.12.2000, p. 10. (10) OJ L 105, 3.5.2000, p. 15. Regulation as amended by Regulation (EC) No 2438/2000 (OJ L 280, 4.11.2000, p. 37). (11) OJ L 55, 24.2.2001, p. 3. (12) OJ L 222, 17.8.2001, p. 53. (13) OJ L 103, 25.4.1979, p. 1. (14) OJ L 206, 22.7.1992, p. 7. (15) OJ L 175, 5.7.1985, p. 40. (16) OJ L 358, 31.12.2002, p. 59. (17) OJ L 198, 22.7.1991, p. 1. (18) OJ L 224, 18.8.1990, p. 19. (19) OJ L 17, 21.1.2000, p. 22. (20) OJ L 93, 31.3.2006, p. 12. (21) OJ L 124, 20.5.2003, p. 36. (22) OJ L 210, 31.7.2006, p. 25. (23) OJ C 316, 27.11.1995, p. 49. (24) OJ L 160, 30.6.2000, p. 1. (25) OJ L 61, 4.3.1994, p. 27. Information referred to in points 3 and 4 shall be provided in a summary form where it is included in the national strategic plan. ‘Non-convergence objective’ regions (if relevant). context indicators and where relevant, national or regional statistics collected by Eurostat as well as in other sources of statistical data. Where relevant, the indicators listed in the National Strategic Plan for the description of the fisheries sector shall be used. Driving forces and development tendencies, including the sectoral and regional dimension of the socio-economic development of the fisheries sector. The description of the strengths and weaknesses, opportunities and threats in the form of a SWOT (strengths, weaknesses, opportunities and threats) analysis aiming to identify the strategic choices made by the Member State for the operational programme and the priority axes. Main outcomes of the analysis. Include a summary of the ex ante evaluation that will identify and appraise the elements referred to in Article 48 of Regulation (EC) No 1198/2006. The ex ante evaluation shall address also the requirements of the environmental assessment provided for by Directive 2001/42/EC of the European Parliament and of the Council (3) (the ‘Strategic Environmental Assessment Directive’). The complete ex ante evaluation shall be presented as an annex to the operational programme. outcomes of the ex ante evaluation referred to in Article 48 of Regulation (EC) No 1198/2006. information on demarcation with similar activities financed by the European Agricultural Fund for Rural Development, the Structural Funds and by the Cohesion Fund, as well as measures taken to ensure complementarity with these funds and other existing financial instruments, where appropriate. 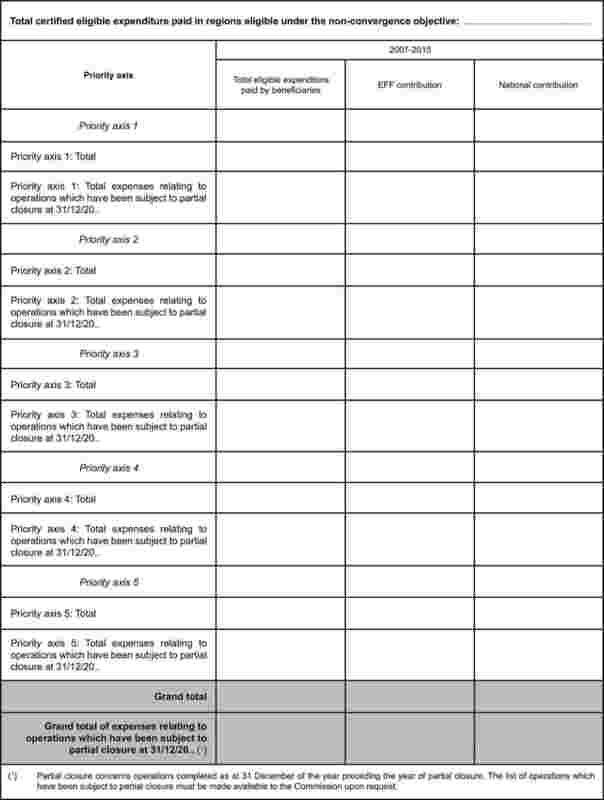 Specific information required for the priority axes and measures (if relevant). Description of the conditions applied where Member States choose the option to allow that the reduction of engine power is achieved by a group of vessels and a description of the mechanism put in place for the supervision of compliance with these conditions. Description of the objective criteria used for the establishment of the maximum amount for the total eligible expenditure to be supported per fishing vessel over the entire programming period for investment on board vessels and selectivity under Article 25 of Regulation (EC) No 1198/2006 and in accordance with Article 6(2) of this Regulation. Description of the methods for the calculation of socio economic compensations provided for under Article 26(3) of Regulation (EC) No 1198/2006 in favour of small scale coastal fishing. Description of the methods for the calculation of premiums for fishers and owners of fishing vessels provided for under Article 26(4) of Regulation (EC) No 1198/2006 in favour of small scale coastal fishing. Description of the methods for the calculation of socio-economic compensations provided for under Article 27 of Regulation (EC) No 1198/2006. Description of how priority to micro and small enterprises is ensured. Description of the mechanisms put in place to ensure that the investments supported under Article 33 of Regulation (EC) No 1198/2006 shall not jeopardise the equilibrium between the fleet size and the corresponding fish resources available. Description of the measures to be taken in order to ensure that the vessels receiving assistance under Article 33 of Regulation (EC) No 1198/2006 shall continue to operate exclusively in inland waters. Description of the objective criteria used for the establishment of the maximum amount for the total eligible expenditure to be supported per vessel operating in inland vessel over the entire programming period for investment on board vessels and selectivity under Article 33 of Regulation (EC) No 1198/2006 and in accordance with Article 6(2) of this Regulation. Description of the methods for the calculation of premiums for the reassignment of vessels operating in inland fishing to activities outside fishing and the measures to be taken in order to ensure that the vessels receiving assistance from EFF shall not return to operate in inland fishing. Description of the methods for the calculation of premiums for temporary cessation of fishing activities under Article 33(4) of Regulation (EC) No 1198/2006. Justification for the running costs whose cost exceeds the ceiling fixed under Article 44(5) of Regulation (EC) No 1198/2006. Justification of actions relating to the preparation, monitoring, evaluation, publicity, control and audit as well as networking whose cost exceed the ceiling fixed under Article 46(2) of Regulation (EC) No 1198/2006. To be drawn up in accordance with this Annex, Part B: Financing plans for the operational programme. Designation by the Member State of the entities provided for in Article 58 of Regulation (EC) No 1198/2006 or where the Member State exercises the option provided for in Article 52 of this Regulation the designation of the bodies and procedures in accordance with the rules laid down in Article 53 of this Regulation. The body responsible for receiving payments made by the Commission and the body or bodies responsible for making payments to the beneficiaries. Description of procedures for mobilisation and circulation of financial flows in order to ensure their transparency. Description of the monitoring and evaluation system as well as the composition of the Monitoring Committee. The arrangements (to be) agreed between the Commission and the Member State for the computerised exchange of data needed to fulfil the management, monitoring and evaluation requirements. The designation of the partners referred to in Article 8 of Regulation (EC) No 1198/2006 and the results of their cooperation. List of the consulted partners and supply of a summary of the results of the consultations. For the purposes of Article 8(2) of Regulation (EC) No 1198/2006, Member States shall, taking into account the need to promote equality between men and women and sustainable development through integration of environmental protection and enhancement, consider the involvement of relevant stakeholders, including non governmental organisations. The elements aiming at ensuring the information and publicity of the operational programme in accordance with the rules laid down in Article 28 of this Regulation. (1) The impact indicators refer to the consequences of the operational programme beyond the immediate effects. (2) The result indicators relate to the direct and immediate effects on beneficiaries brought about by the operational programme. (3) OJ L 197, 21.7.2001, p. 30. (4) The EFF co-financing rate may be rounded-off in the table. The precise rate used to reimburse payments is the percentage (d). (5) In the case of operational programmes covering a mix of regions eligible under the convergence objective and the non-convergence objective, the total public contribution for priority axis 5 may be allocated to the predominant type of regions which have the highest total amount of public contribution in the operational programme. (6) The EFF co-financing rate may be rounded-off in the table. The precise rate used to reimburse payments is the percentage (d). (7) In the case of operational programmes covering a mix of regions eligible under the convergence objective and the non-convergence objective, the total public contribution for priority axis 5 may be allocated to the predominant type of regions which have the highest total amount of public contribution in the operational programme. On an azure field a circle of twelve golden mullets, their points not touching. The emblem has the form of a blue rectangular flag of which the fly is one and a half times the length of the hoist. Twelve gold stars situated at equal intervals form an invisible circle whose centre is the point of intersection of the diagonals of the rectangle. The radius of the circle is equal to one third of the height of the hoist. 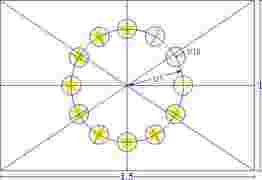 Each of the stars has five points which are situated on the circumference of an invisible circle whose radius is equal to 18th of the height of the hoist. All the stars are upright, i.e. with one point vertical and two points in a straight line at right angles to the mast. The circle is arranged so that the stars appear in the position of the hours on the face of a clock. Their number is invariable. PANTONE YELLOW for the stars. If the four-colour process is used, recreate the two standard colours by using the four colours of the four-colour process. PANTONE YELLOW is obtained by using 100 % ‘Process Yellow’. PANTONE REFLEX BLUE is obtained by mixing 100 % ‘Process Cyan’ and 80 % ‘Process Magenta’. 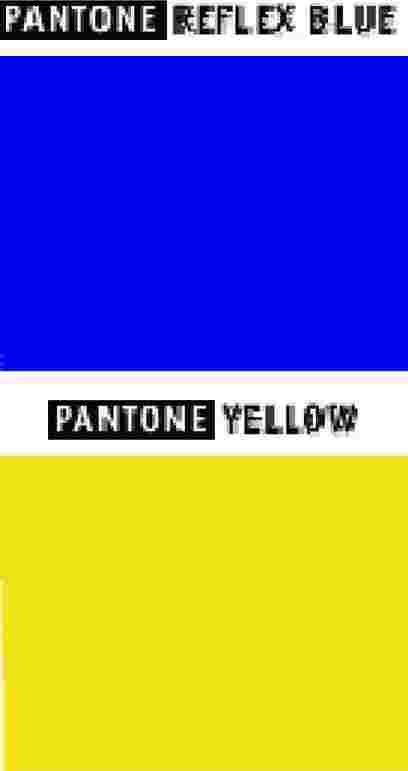 In the web-palette PANTONE REFLEX BLUE corresponds to colour RGB:0/0/153 (hexadecimal: 000099) and PANTONE YELLOW to colour RGB:255/204/0 (hexadecimal: FFCC00). If there is no alternative to a coloured background, put a white border around the rectangle, the width of the border being 1/25th of the height of the rectangle. The data on operations that the Commission may request at any time under Article 40 of this Regulation comprises the following information, without prejudice to other information required for financial management, monitoring, control or evaluation and specified in Regulation (EC) No 1198/2006. At the written request of the Commission, the Member State shall provide the Commission with the appropriate information within 15 working days of receipt of the request or other agreed period for the purpose of carrying out documentary and on-the-spot checks. The Commission may require the information at the level of the operations, measures, priority axes or of the operational programme. Commission Decision approving the Operational programme … No … of ../../200..
Wording of columns: see hereafter. Operation identification number (number allocated by the managing authority when an administrative decision granting public aid is taken — 20 characters maximum). (To be completed only where the operation comes under Priority axis 1: Community Fleet Register number (CFR) (do not give registration number); an operation shall concern only one vessel. The place where the operation is carried out (commune). NUTS III code for the place where the operation is carried out. Total cost taken into account in the decision granting public aid (EUR). Total public cost taken into account in the decision granting public aid (EUR). EFF aid granted to the operation (EUR). Date of the administrative decision granting public aid (dd/mm/yyyy). Action (1 digit) in accordance with nomenclature (individual operation may consist of more than one action; in that case, give one action per line and use several lines). Implementation data (1 or 2 digits) in accordance with nomenclature (an action forming part of an operation may feature more than one implementation data; in that case, give one implementation data only per line and use several lines). Physical quantity achieved (one quantity for each implementation data). State of implementation of operation (1 digit): code 0 (operation covered by a decision granting aid but for which no expenditure has yet been declared to the managing authority)/code 1 (operation under way)/code 2 (operation interrupted following partial implementation)/code 3 (operation abandoned following partial implementation)/code 4 (operation completed). Eligible expenditure certified and actually paid by beneficiaries (EUR) whose accuracy has been checked in accordance with Article 39(2) of this Regulation. National contribution (EUR): aids paid to beneficiaries by the Member State, including subsidies and other public aids, at national, regional or local level, within the limits set by Annex II to Regulation (EC) No 1198/2006. 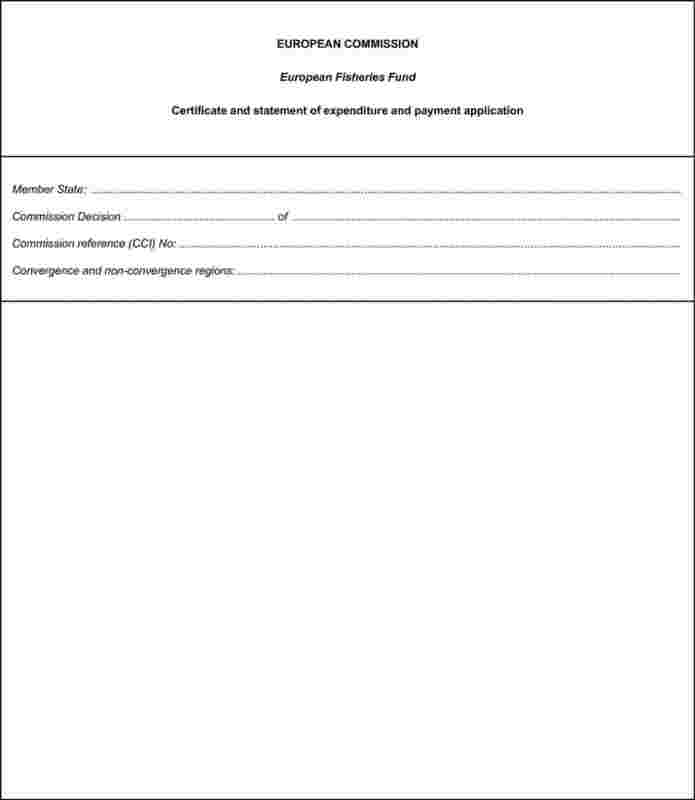 EFF aid paid to beneficiaries (EUR). Data 1: Number of fishers/owners of fishing vessels that have received premiums in order to improve management and control of access conditions to certain fishing areas. Data 2: Number of fishers/owners of fishing vessels that have received premiums in order to promote the organisation of the production, processing and marketing chain of fisheries products. Data 3: Number of fishers/owners of fishing vessels that have received premiums in order to encourage voluntary steps to reduce fishing effort for the conservation of resources. Data 4: Number of fishers/owners of fishing vessels that have received premiums in order to encourage the use of technological innovations that do not increase fishing effort. Data 5: Total number of fishers/owners of fishing vessels that have received premiums in order to improve safety training. Data 6: Number of female fishers/owners of fishing vessels that have received premiums in order to improve safety training. Data 7: Total number of fishers/owners of fishing vessels that have received premiums in order to improve professional skills. Data 8: Number of female fishers/owners of fishing vessels that have received premiums in order to improve professional skills. Data 1: Total number of fishers concerned by the diversification of activities, if appropriate. Data 2: Number of female fishers concerned by the diversification of activities, if appropriate. Data 3: Total number of fishers concerned by early departure from the fishing sector. Data 4: Number of female fishers concerned by early departure from the fishing sector. Data 7: Total number of fishers concerned by the upgrading professional skills. Data 9: Total number of fishers benefiting of schemes for retraining outside fishing sector. Data 10: Number of female fishers benefiting of schemes for retraining outside fishing sector. Data 11: Number of training days received. Data 12: Total number of fishers benefiting from the non-renewable compensations, if appropriate. Data 13: Number of female fishers benefiting from the non-renewable compensations, if appropriate. Data 1: Unit that has implemented aqua-environmental measures as provided for in Article 30(2)(a) of Regulation (EC) No 1198/2006. Data 2: Unit that has adhered to the Community eco-management and audit scheme (EMAS). Data 3: Unit that has put in place organic production. Data 1: Mollusc farmer that has benefited from compensation. Data 1: Farmer that has benefited from compensation. Data 1: Tonnage of vessel modernised (GT). Data 2: Power of vessel modernised (kW). Data 3: Tonnage of vessel re-assigned (GT). Data 4: Power of vessel re-assigned (kW). Data 1: Unit that has benefited. Data 1: Tonnes/year of fresh or chilled products. Data 2: Tonnes/year of preserved or semi-preserved products. Data 3: Tonnes/year of frozen or deep-frozen products. Data 4: Tonnes/year of other processed products (prepared meals, smoked, salted, dried products). Data 5: size of enterprise (Micro, Small, Medium, Large). Data 1: Unit that has benefited from improved hygiene/working conditions. Data 2: Unit that has benefited from improved environmental conditions. Data 3: Unit that has put in place improved production systems (quality, technological innovations). Data 4: Size of enterprise (Micro, Small, Medium, Large). Data 1: m2 of effective surface area. Data 2: Size of enterprise (Micro, Small, Medium, Large). Data 3: Unit that has put in place improved systems (quality, technological innovations). Data 4: Unit that has put in place the treatment, processing and marketing of fisheries and aquaculture products wastes. Data 5: Unit benefiting from this action broken down by size of enterprise (Micro, Small, Medium, Large). Data 1: Producers' organisations created. Data 2: Producers' organisations restructured. Data 3: Operation that upgrades professional skills, or develops new training methods and tools. Data 4: Operation that promotes partnership between scientists and operators in the fisheries sector. Data 5: Operation on networking and exchange of experience and best practice among organisations promoting equal opportunities between men and women and other stakeholders. Data 1: Marine area (km2) protected by the installation of static or movable facilities. Data 2: Operation concerning rehabilitation of inland waters. Data 3: Operation concerning Nature 2000 areas. Data 4: Operation concerning spawning grounds and migration routes rehabilitated. Data 1: m3 of cold storage created. Data 2: m3 of storage other than cold stores. Data 3: Operation of handling installations. Data 4: Operation of ice machines. Data 6: Operation regarding other facilities. Data 7: m2 of quays restructured. Data 8: Linear metres of quays restructured. Data 9: m2 of surface usable for first sale. Data 1: Landing site that has benefited. Data 1: Fishing shelter that has benefited. Data 1: Campaign for fisheries and aquaculture products. Data 2: Campaign to improve the image of fisheries. Data 3: Operation to promote products obtained using methods with low impact on the environment. Data 4: Operation to promote products recognised under the terms of Council Regulation (EEC) No 2081/92 (1). Data 5: Operation to implement a quality policy for fisheries and aquaculture products. Data 6: Operation to promote quality certification. Data 7: Operation to promote the supply of the market of surplus or underexploited species. Data 8: Operation to implement market surveys. Data 1: Test on innovative technology. Data 2: Test on management plans and fishing effort allocation plans. Data 3: Operation to develop and test methods to improve gear selectivity/reduce by-catches and discards. Data 4: Operation to test alternative types of fishing management techniques. Data 1: Vessel modified for historical heritage. Data 2: Vessel modified for fisheries research (FR). Data 3: Vessel modified for training activities (TA). Data 4: Vessel modified for control (C). Data 1: Operation for strengthening the competitiveness of the fisheries areas. Data 2: Operation for restructuring and redirecting economic activities. Data 3: Operation for diversifying activities. Data 4: Operation for adding value to fisheries products. Data 5: Operation for supporting small fisheries communities and tourism related infrastructure. Data 6: Operation for protecting the environment in fisheries areas. Data 7: Operation for re-establishing the production potential in fisheries areas. Data 8: Operation for promoting inter-regional and trans-national cooperation. Data 9: Operation for acquiring skills and facilitating the preparation and implementation of the local development strategy. Data 10: Operation for the contribution to the running cost of the groups. Data 11: Operation on communication actions by the groups. Data 1: Operation for technical assistance for the implementation of the operational programme. Data 2: Operation for improving administrative capacity. Data 3: Operation on communications actions. Data 4: Operation for facilitating networking. Data 5: Operations for evaluation. Data 1: Operation for publicity. Data 2: Operation for information to stakeholders. Data 1: Operation of other kind of technical assistance. (1) OJ L 208, 24.7.1992, p. 1. The assurance provided on the functioning of the systems is determined by the degree of confidence resulting from the conclusions of the system audits and from the audits of operations in the sample selected by a random statistical sampling method. In order to obtain a high level of assurance, that is, a reduced audit risk, the audit authority shall combine the results of system audits and audits of operations. The audit authority first evaluates the reliability of the systems (high, average or low), taking into account the results of the system audits, so as to determine the technical parameters of the sampling, in particular the confidence level and the expected error rate. Member States may also use the results of the report on the compliance assessment under Article 71(2) of Regulation (EC) No 1198/2006. The combined level of assurance obtained from the system audits and the audits of operations must be high. The confidence level used for sampling operations must not be less than 60 % with a maximum materiality level of 2 %. For a system evaluated as having low reliability, the confidence level used for sampling operations must not be below 90 %. The audit authority shall describe in the annual control report the way assurance has been obtained. The reliability of management and control systems shall be determined using criteria established by the audit authority for systems audits, including a quantified assessment of all key elements of the systems and encompassing the main authorities and intermediate bodies participating in the management and control of the operational programme. A record of the assessments carried out shall be kept in the audit file. Identification of the audit authority responsible for drawing up the audit strategy and of any other bodies which have contributed. Explanation of the procedure followed for drawing up the audit strategy. Specification of the overall objectives of the audit strategy. Explanation of the functions and responsibility of the audit authority and other bodies carrying out audits under its responsibility. Indication of the independence of the audit authority from the managing authority and certifying authority. Confirmation by the audit authority that the bodies that carry out the audits pursuant to Article 61(3) of Regulation (EC) No 1198/2006 have the requisite functional independence. Indication of any national regulatory framework that affects the audit authority, and its functions. Indication of the period covered by the strategy. Indicate the audit methodology to be followed taking account of internationally accepted audit standards (including but not limited to, INTOSAI, IFAC and IIA), audit manuals and any other specific documents. Materiality thresholds for planning purposes and for reporting deficiencies. Indication of the types of audits to be carried out (system audits, audits of operations). Indication of any horizontal issues to be covered by the system audits, such as public procurement, state aid, environmental requirements, equal opportunities and IT systems. specification of the procedure for determining steps to be taken where material errors are detected. Indication and justification of the priorities and audit objectives established for the whole programming period. Explanation of the linkage of the risk assessment results to the audit work planned. 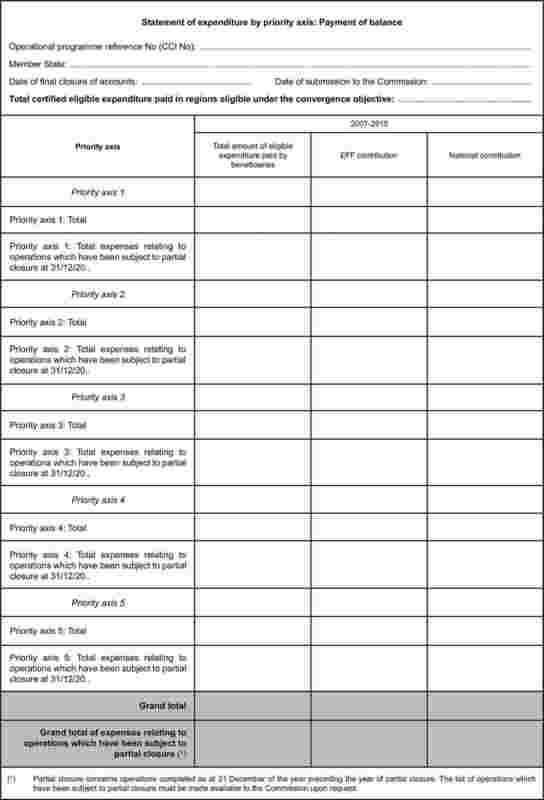 An indicative audit schedule of audit assignments for the forthcoming year provided in a table format. Indication of the procedures followed, including the extent to which the results of previous audits of the bodies and systems have been taken into account (such as audits from the 2000 to 2006 period, audit work for the compliance assessment). Indication of the managing authority, certifying authority and intermediate bodies covered. Indication of the risk factors taken into account, including any horizontal issues identified as risk areas. Indication of the results through identification and prioritisation of the key bodies, processes, controls and priority axes to audit. Indication of the extent to which certain components are audited by other auditors and the extent of potential reliance on such work. Explanation of how the audit authority will ensure the quality of the work carried out by the other bodies, taking account of internationally accepted auditing standards. Indication of planned resources to be allocated, at least for the forthcoming year. Indication of internal procedures for reporting, such as provisional and final audit reports, and of the right of the body audited to be heard and to provide an explanation before a final position is taken. Indication of the responsible audit authority and other bodies that have been involved in preparing the report. Indication of the 12-month (reference) period from which the random sample was drawn. Identification of the operational programme covered by the report (CCI number) and of its managing and certifying authority. Description of the steps taken to prepare the report. Indication of any significant changes in the management and control systems notified to the audit authority as compared with the description provided under Article 71(1) of Regulation (EC) No 1198/2006 and of the dates from which the changes apply. Indication of any changes that have been made to the audit strategy or are proposed, and of the reasons behind them. Indication of the bodies that have carried out systems audits, including the audit authority itself. Summary list of the audits carried out (bodies audited). Description of the basis for selection of the audits in the context of the audit strategy. Description of the principal findings and conclusions drawn from the audit work for the management and control systems, and their functioning, including the sufficiency of management checks, certification procedures and the audit trail, adequate separation of functions and compliance with Community requirements and policies. Indication of whether any problems identified were considered to be of a systemic character, and the measures taken, including a quantification of the irregular expenditure and any related financial corrections. Indication of the bodies that have carried out the sample audits, including the audit authority. Description of the basis for the selection of the sample(s). Indication of the materiality level and, in the case of statistical sampling, the confidence level applied and the interval, if applicable. 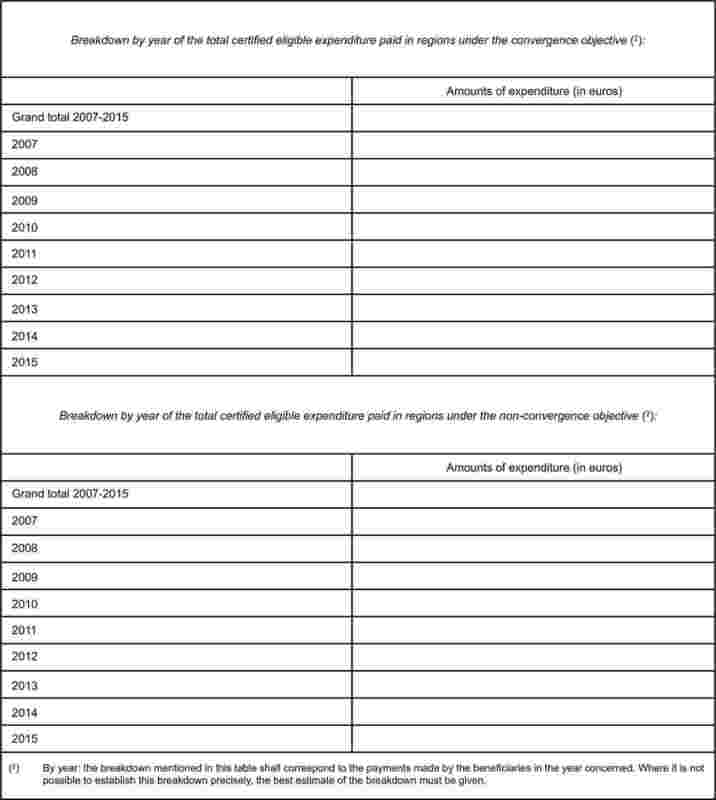 Summary table (see point 9) indicating the eligible expenditure declared to the Commission during the calendar (reference) year (ending in the audit period), the amount of expenditure audited, and the percentage of expenditure audited in relation to total eligible expenditure declared to the Commission (both for the last calendar year and cumulatively). Information relating to the random sample must be distinguished from that related to other samples. Description of the principal results of the audits, indicating in particular the amount of irregular expenditure and the error rate resulting from the random sample audited. Indication of the conclusions drawn from the results of the audits with regard to the effectiveness of the management and control system. Information on the follow-up of irregularities including revision of previously reported error rates. Indication of whether any problems identified were considered to be systemic in nature, and the measures taken, including a quantification of the irregular expenditure and any related financial corrections. Description of the procedure for supervision applied by the audit authority to other bodies carrying out the audits pursuant to Article 61(3) of Regulation (EC) No 1198/2006 (if applicable). Information on the follow-up of outstanding audit recommendations and on the follow up of systems audits and audits of operations from earlier years. I, the undersigned, representing the (name of body designated by Member State), have examined the functioning of the management and control systems in the operational programme (name of operational programme, CCI code number, period), in order to issue an opinion on whether the systems functioned effectively so as to provide reasonable assurance that the statements of expenditure presented to the Commission are correct and as a consequence reasonable assurance that the underlying transactions are legal and regular. The examination was carried out in accordance with the audit strategy in respect of this programme during the period 1 July to 30 June (year) and reported in the attached annual control report under Article 61(1)(e)(i) of Regulation (EC) No 1198/2006. Based on the examination referred to above, it is my opinion that for the abovementioned period the management and control system established for the programme … (name of operational programme, CCI code number, period) complied with the applicable requirements of Articles 57 to 61 of Regulation (EC) No 1198/2006 and Chapter VII of Commission Regulation (EC) No 498/2007 (7) and functioned effectively so as to provide reasonable assurance that the statements of expenditure presented to the Commission are correct and as a consequence reasonable assurance that the underlying transactions are legal and regular. Based on the examination referred to above, it is my opinion that for the abovementioned period the management and control systems established for the programme … (name of operational programme, CCI code number, period) complied with the applicable requirements of Articles 57 to 61 of Regulation (EC) No 1198/2006 and Chapter VII of Commission Regulation (EC) No 498/2007 and functioned effectively so as to provide reasonable assurance that the statements of expenditure presented to the Commission are correct and as a consequence reasonable assurance that the underlying transactions are legal and regular, except in the following respects (8). My reasons for considering that this (these) aspect(s) of the systems did not comply with the requirements and/or did not operate in such a way as to give a reasonable assurance that the statements of expenditure presented to the Commission are correct as follows … (9). I estimate the impact of the qualification(s) to be … of the total expenditure declared. The Community contribution affected is thus …. Based on the examination referred to above, it is my opinion that for the abovementioned period the management and control system established for the programme … (name of operational programme, CCI code number, period) did not comply with the requirements of Articles 57 to 61 of Regulation (EC) No 1198/2006 and Chapter VII of Commission Regulation (EC) No 498/2007 and did not function effectively so as to provide reasonable assurance that the statements of expenditure presented to the Commission are correct and, as a consequence, does not provide reasonable assurance that the underlying transactions are legal and regular. (1) Expenditure for complementary sample and expenditure for random sample not in the reference year. (2) Amount of expenditure audited. (3) Percentage of expenditure audited in relation to eligible expenditure declared to the Commission in the reference year. (4) Expenditure for complementary sample and expenditure for random sample not in the reference year. (5) Amount of expenditure audited. (6) Percentage of expenditure audited in relation to eligible expenditure declared to the Commission in the reference year. (7) OJ L 120, 10.5.2007, p. 1. (8) Indicate the body or bodies and the aspect(s) of their systems that did not comply with requirements and/or did not operate effectively. (9) Indicate for each body and each aspect of the system the reasons for the qualification. (10) Indicate for each body and each aspect the reasons for the adverse opinion. Indication of the last reference period from which the random sample was drawn. Identification of the operational programme covered by the report and its managing and certifying authorities. Indication of any significant changes in the management and control systems notified to the audit authority as compared with the description provided under Article 71(1) of Regulation (EC) No 1198/2006, and of the dates from which the changes apply. Indication of any changes that have been made to the audit strategy and reasons for such changes. Summary list of audits carried out: bodies audited and year of audit. Description of the basis for selection of audits in the context of the audit strategy (2). Description of the principal findings and the conclusions drawn from the audit work for the management and control systems and their functioning, including the sufficiency of management checks, certification procedures and the audit trail, adequate separation of functions and compliance with Community requirements and policies (2). Indication of whether any problems identified were considered to be of a systemic character, and the measures taken, including a quantification of the irregular expenditure and any related financial corrections (2). Indication of the bodies that carried out the sample audits, including the audit authority itself. Description of the basis for selection of the sample(s). Description of the principal results of the audits, indicating in particular the amount of irregular expenditure and the error rate resulting from the random sample audited (2). Information on the follow-up of irregularities, including revision of previously reported error rates. Indication of whether any problems identified were considered to be systemic in nature, and the measures taken, including a quantification of the irregular expenditure and any related financial corrections (2). Information on the follow-up of the results of systems audits and audits of operations. Summary of audits of closure procedure of managing and certifying authorities and intermediate bodies. Summary of the results of the examination of the debtors’ ledger kept under Article 60(f) of Regulation (EC) No 1198/2006. Summary of the results of re performance of controls on the accuracy of the amounts declared in relation to supporting documents. Summary of the results of examination of reports of other national or Community audit bodies (specify by category which reports have been received and examined). Summary of the results of the examination of information relating to follow-up of audit findings and dealing with irregularities. Summary of the results of the examination of additional work carried out by managing and certifying authorities to enable an unqualified opinion to be provided. Details of any factors that have limited the scope of the examination by the audit authority must be reported (3). Estimated amounts of expenditure and the Community contribution that are affected must be stated. Confirmation that the procedure for reporting and following up irregularities, including the treatment of systemic problems, has been carried out in accordance with regulatory requirements. Confirmation of the accuracy of the information given in final report on implementation on the irregularities reported under Article 70(1)(b) of Regulation (EC) No 1198/2006. A list of cases of irregularity regarded as systemic and the amounts of expenditure affected. I, the undersigned, … representing the (name of the body designated by Member State), have for the operational programme … (name of the operational programme, CCI code number, period) examined the results of the audit work carried out on this programme by or under the responsibility of the audit authority in accordance with the audit strategy (and have carried out the additional work I judged necessary). The results of the examination and the additional work I have performed are summarised in the attached final control report (which also contains the information required by the annual control reports for the period 1 January 2015 to 31 December 2016). I have planned and performed this work with a view to obtaining a reasonable assurance as to whether the payment application for the balance of the Community contribution to the programme is correct and valid and the underlying transactions covered by the final statement of expenditure are legal and regular. The examination was carried out in accordance with the audit strategy in respect of this programme and reported in the attached final control report under Article 61(1)(f) of Regulation (EC) No 1198/2006. The cases of irregularity and error rates found in the audit work is not such as to preclude an unqualified opinion given the satisfactory way they have been dealt with by the managing authority and the trend in the level of their occurrence over time. The cases of irregularity and error rates found in the audit work and the way they have been dealt with by the managing authority are such as to preclude an unqualified opinion. A list of these cases is provided in the final control report, together with an indication of their possible systemic character and the scale of the problem. The amounts of total declared expenditure and public contribution that could be affected are … respectively. As a consequence, the corresponding Community contribution that could be affected is …. Based on the examination referred to above, it is my opinion that the final statement of expenditure presents fairly, in all material respects, the expenditure paid under the operational programme, that the application for payment of the balance of the Community contribution to this programme is valid and that the underlying transactions covered by the final statement of expenditure are legal and regular. Based on the examination referred to above, it is my opinion that the final statement of expenditure presents fairly, in all material respects, the expenditure paid under the operational programme, that the application for payment of the balance of the Community contribution to this programme is valid and that the underlying transactions covered by the final statement of expenditure are legal and regular, except with regard to the matters referred to at point 2 above and/or to the observations at point 3 regarding the error rates and cases of irregularity and the way they have been dealt with by the managing authority, the impact of which is quantified above. I estimate the impact of these qualifications to be … of the total expenditure declared. The Community contribution affected is thus …. Based on the examination referred to above, and in particular in view of the matters referred to at point 2 and/or the error rates and cases of irregularity and the fact that they have not been dealt with satisfactorily by the managing authority as reported at point 3, it is my opinion that that the final statement of expenditure does not present fairly, in all material respects, the expenditure paid under the operational programme, that, as a consequence, the application for payment of the balance of the Community contribution to this programme is not valid and that the underlying transactions covered by the final statement of expenditure are not legal and regular. (1) For changes not indicated in earlier annual control reports. (2) For audits not covered by earlier annual control reports. (3) Examples of such matters include systemic problems, weaknesses in management and control systems, lack of supporting documents, and cases under legal proceedings. (7) Expenditure for complementary sample and expenditure for random sample not in the reference year. (8) Amount of expenditure audited. (9) Percentage of expenditure audited in relation to eligible expenditure declared to the Commission in the reference year. 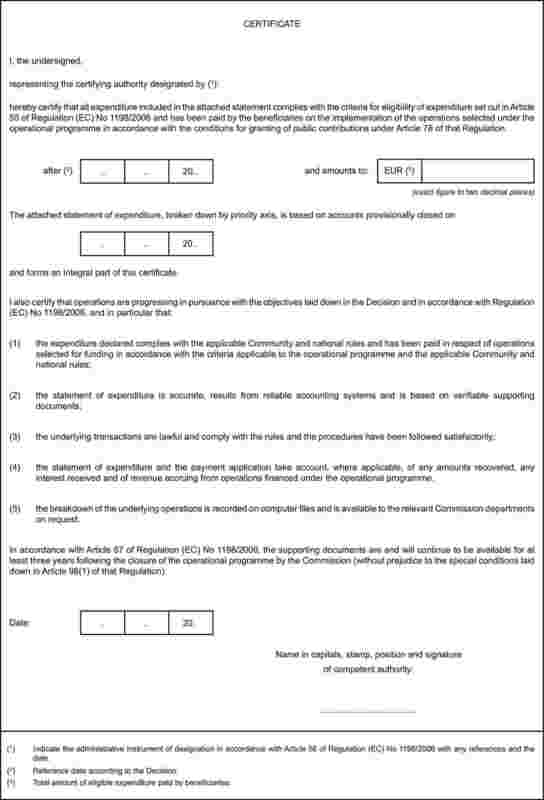 The managing authority for the programme … (name of the operational programme, CCI code number, period) has submitted a statement of expenditure relating to operations [completed as at … (date up to which operations were completed)/completed between … and … (dates between which operations were completed/and is applying for partial closure of the programme under Article 85(2)(b) of Regulation (EC) No 1198/2006 for these operations. I have planned and performed this work with a view to obtaining a reasonable assurance as to whether the statement of expenditure concerned is correct and valid and the underlying transactions covered by the statement of expenditure are legal and regular. 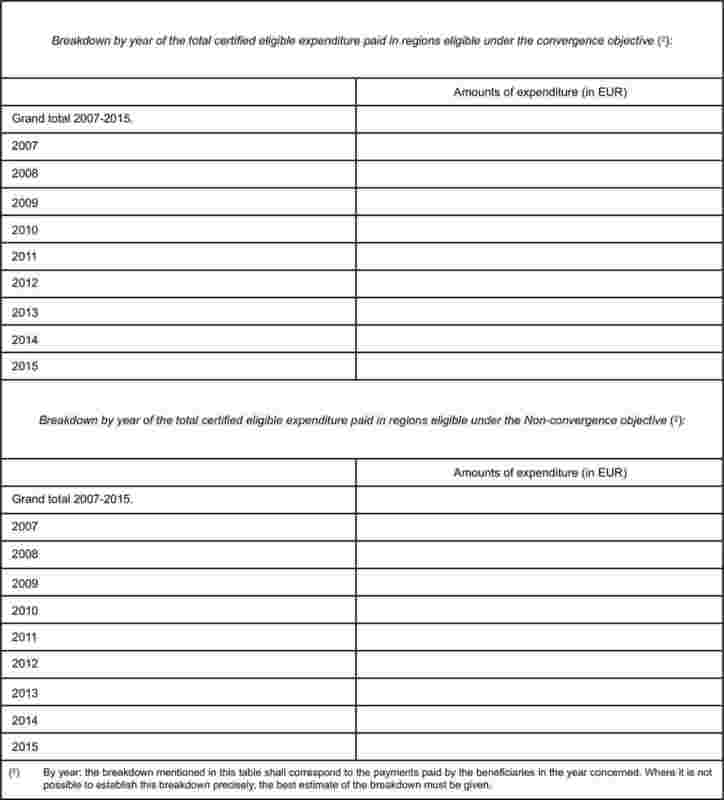 Based on the examination referred to above, it is my opinion that the statement of expenditure on completed operations submitted by the managing authority for the programme … (name of operational programme, CCI code number, period) for the purpose of partial closure of the programme in respect of operations (completed as at …/completed between … and …) presents fairly, in all material respects, the expenditure paid and that the underlying transactions are legal and regular. (1) This co-financing rate is found in the financial table of the operational programme for the priority axis concerned. (2) This co-financing rate is found in the financial table of the operational programme for the priority axis concerned. (3) This co-financing rate is found in the financial table of the operational programme for the priority axis concerned. (4) This co-financing rate is found in the financial table of the operational programme for the priority axis concerned. Description of the procedures for verification. Bodies carrying out such verifications. Description of the procedures by which applications for reimbursement are received, verified, and validated, and by which payments to beneficiaries are authorised, executed and accounted for (including flowchart indicating all bodies involved). Bodies carrying out each step in the processing of the application for reimbursement. NB: This section must be completed separately for each intermediate body. Indicate the authority which has delegated the function to the intermediate bodies. 3.1.1. Specification of the main functions/tasks of the intermediate bodies. 3.2.2. Written procedures prepared for use by staff of the intermediate body (date and reference). 3.2.3. Description of procedures for selecting and approving operations (if not described under 2.2.3). 3.2.4. Verification of operations (Article 59(b) of Regulation (EC) No 1198/2006) (if not described under 2.2.4). 3.2.5. Description of procedures for processing of applications for reimbursement (if not described under 2.2.5). 4.1.1. The date and form of the formal designation authorising the certifying authority to carry out its functions. 4.1.2. Specification of the functions carried out by the certifying authority. 4.1.3. Functions formally delegated by the certifying authority (functions, intermediate bodies, form of delegation). 4.2.1. Organisation chart and specification of the functions of the units (including indicative number of posts allocated). 4.2.2. Written procedures prepared for use by staff of the certifying authority (date and reference). 4.3.1. 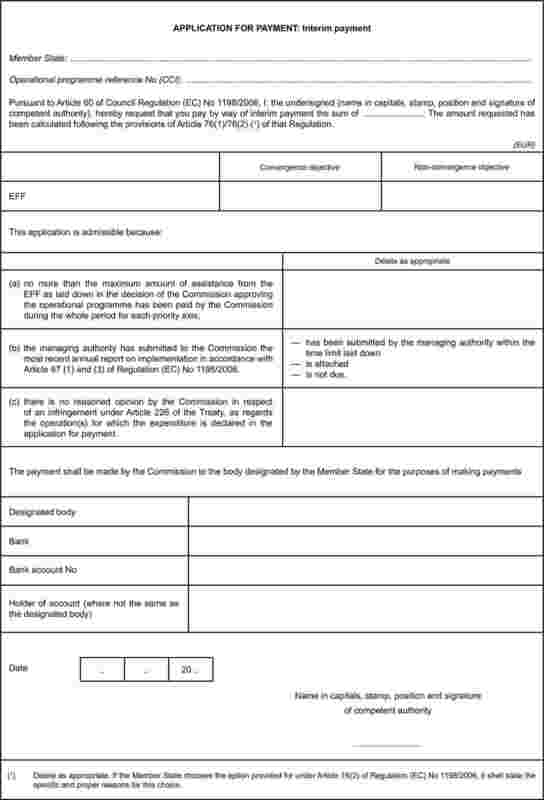 Description of the procedure by which statements of expenditure are drawn up, certified and submitted to the Commission. 4.3.2. Description of the steps performed by the certifying authority to ensure fulfilment of requirements under Article 60 of Regulation (EC) No 1198/2006). 4.3.3. Arrangements for access of the certifying authority to the detailed information on operations and verifications and audits held by the managing authority, intermediate bodies and audit authority. 4.4.1. Description of the accounting system to be set up and used as a basis for certification of expenditure to the Commission. Arrangements for forwarding aggregated data to the certifying authority in the case of a decentralised system. The link between accounting system and the information system to be set up (point 6). Total expenditure by priority axis. 4.5.1. Description of the system for ensuring the prompt recovery of Community assistance. 4.5.2. Arrangements made to maintain a debtors’ ledger and to deduct amounts recovered from expenditure to be declared. 5.2.1. Organisation charts (including the number of posts attributed). 5.2.2. Arrangements for ensuring the independence. 5.2.3. Required qualification or experience. 5.2.4. Description of procedures for monitoring the implementation of recommendations and corrective measures from audit reports. 5.2.5. Description of the procedures (where appropriate) for the supervision of the work of other bodies by the audit authority. Description of the procedures for preparation of the annual control report, annual opinion and closure declaration. If not, indication of the date when it will be operational. I, the undersigned representing (name of the audit authority or the operationally independent body designated by the Member State under Article 71(3) of Regulation (EC) No 1198/2006, as the body responsible for drawing up a report setting out the results of an assessment of the management and control systems established for the programme … (name of operational programme, CCI code number, period) and for giving an opinion on their compliance with Articles 57 to 61 of Regulation (EC) No 1198/2006 have carried out an examination in accordance with Article 50 of Regulation (EC) No 498/2007. The examination was based on the description of the management and control systems received on dd/mm/yyyy from (name of body/bodies submitting the description). In addition, we have examined further information concerning (subjects) and interviewed staff of (bodies whose staff was interviewed). The examination covered the managing, certifying and audit authorities, the body designated to receive the payments made by the Commission and to make the payments to beneficiaries and the following intermediate bodies (list …). On the basis of the examination referred to above, it is my opinion that the management and control systems established for the programme … (name of operational programme, CCI code number, period) comply with the requirements of Articles 57 to 61 of Regulation (EC) No 1198/2006 and Chapter VII of Regulation (EC) No 498/2007. On the basis of the examination referred to above, it is my opinion that the management and control systems for the programme … (name of operational programme, CCI code number, period) comply with the requirements of Articles 57 to 61 of Regulation (EC) No 1198/2006 and Chapter VII of Regulation (EC) No 498/2007, except in the following respects … (2). On the basis of the examination referred to above, it is my opinion that the management and control systems for the programme (s) … (name of operational programme, CCI code number, period) do not comply with the requirements of Articles 57 to 61 of Council Regulation (EC) No 1198/2006 and Chapter VII of Regulation (EC) No 498/2007. (1) Where the opinion is issued by the audit authority, the latter must provide a separate ‘Declaration of Competence and Operational Independence’ on its own functions under Article 65 of Regulation (EC) No 1198/2006. (2) Indicate the body or bodies and the aspects of their systems that appear not to comply with the requirements. (3) Indicate the reason(s) for the reservations entered for each body and on each aspect. (4) Indicate the reason(s) for the adverse opinion for each body and on each aspect. (1) Only provisional forecasts of likely applications for payment in respect of the Community contribution, and not total expenditure forecast, shall be stated in the table. In the provisional forecasts of likely applications for payment, the Community contribution must be stated for the year in question, and must not be cumulated from the beginning of the programming period. For each quantifiable result indicator mentioned in the operational programme related to the objectives and the expected results, (for the year N, for the previous reporting years, as well as cumulatively). In addition the information may be presented graphically. All indicators shall be broken down by gender where possible. If the figures (data) are not yet available, information on when they will become available and how the Managing Authority will provide it to the Commission shall be stated. 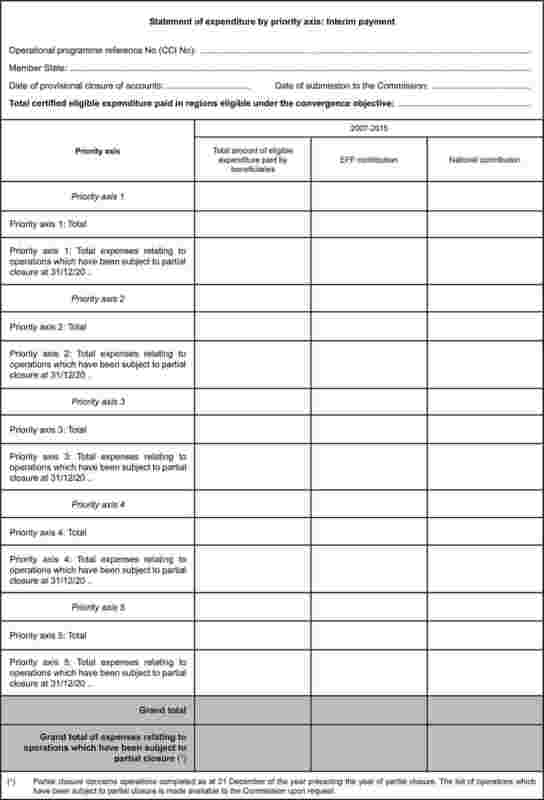 Analysis of the results of in implementing the fishing effort adjustments plans using the indicators defined in the operational programme in the form of table as provided for in point 3.1. Fisheries areas selected, groups selected, budget allocated to them, percentage of fisheries areas covered by the local development strategies.